Well, folks, it’s been a while since my last update on acquisitions. And believe me, there have been plenty of acquisitions in the interim. My biggest haul was pulled off lately when a local used bookstore, which just closed down, held a huge final sale in which prices were ridiculously low. How could I not take advantage of these deals? There are plenty of books to cover and I know I’ll manage to forget some, so let’s get right to it! This is the last French book to be covered in this post. 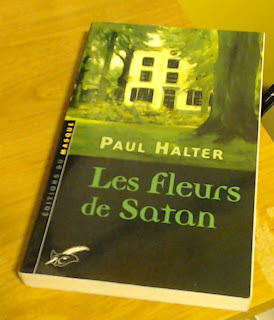 Paul Halter’s Les Fleurs de Satan (Satan’s Flowers) is one of the few Halters I hadn’t yet owned in my collection. 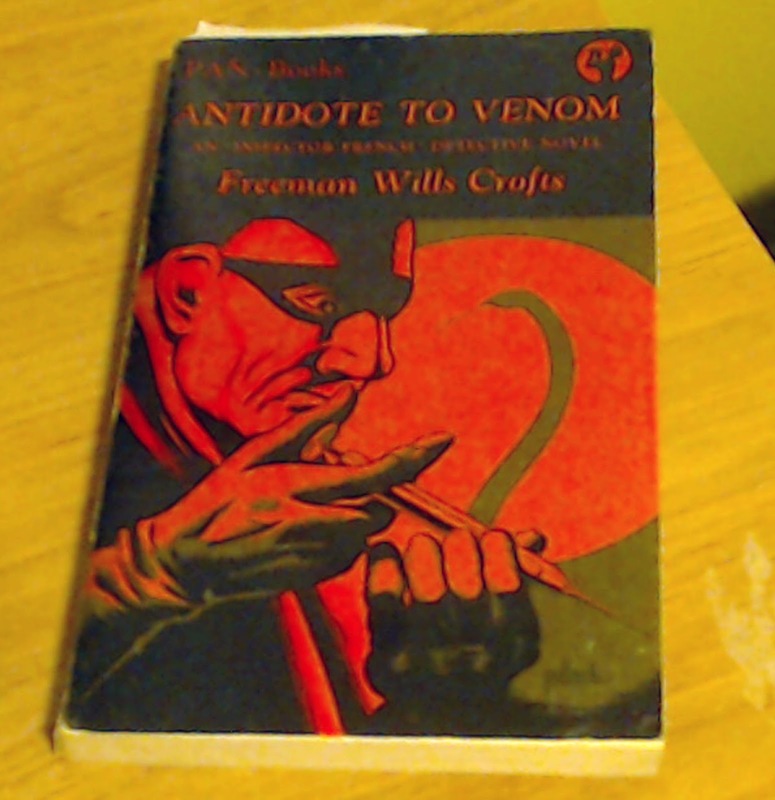 This is an intriguing addition to the collection, and I hope to be able to read it soon! John Rhode’s Death in Harley Street promises to provide an ingenious gimmick, based on the review in Curt Evans’ Masters of the Humdrum Mystery. I really couldn’t say no, especially after seeing copies for less than $20 floating around. It might seem odd that I purchased this next book, a collection of short stories starring Phillip Marlowe. These were (almost) all written by authors other than Raymond Chandler, although the last story is one of Chandler’s own. Basically, I purchased this book because the more I learn about Chandler the more fascinated I am. 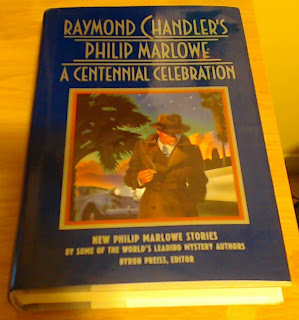 As incompetent as I find The Big Sleep, as overly-padded as I consider The Long Goodbye, Chandler is one of the most enduring authors in detective fiction, like it or not. And instead of just bashing his stuff out of principle, I think I’ve actually managed to write an intelligent appraisal or two, or at least my review of Farewell, My Lovely, a book that I find myself liking more when I think back on it. 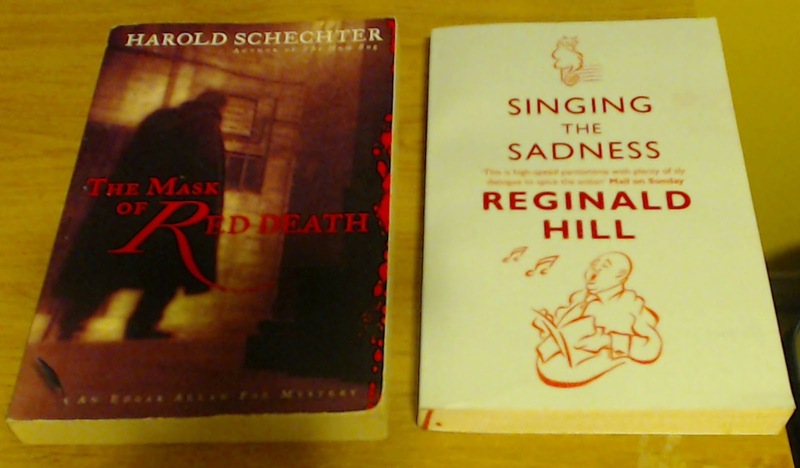 The three books above are all historical mysteries, which is why I grouped them together. There was no real reasoning behind these purchases other than the plot descriptions sounded like plenty of fun and the sale made the prices too good to pass up! 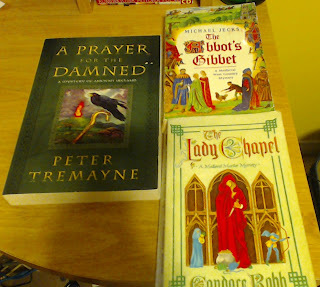 So I look forward to reviewing, sometime in the distant future, Peter Tremayne’s A Prayer for the Damned, Michael Jecks’ The Abbot’s Gibbet, and Candace Robb’s The Lady Chapel. 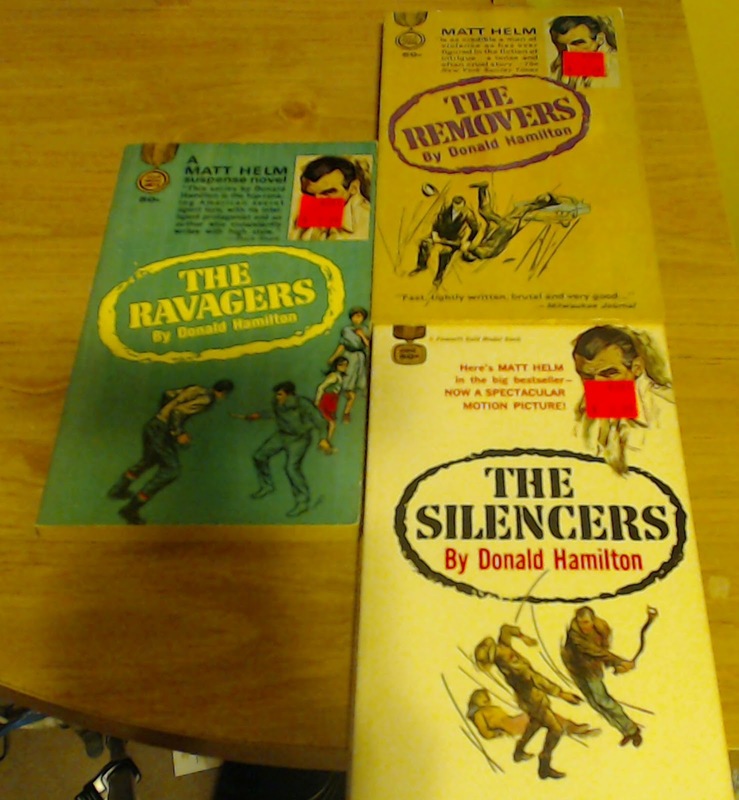 These three books, with the price tags still attached, are all Matt Helm novels by Donald Hamilton: The Ravagers, The Removers, and The Silencers. 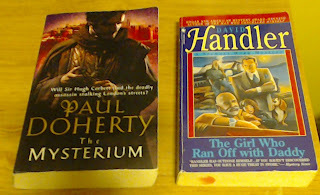 I am intrigued by the author and want to get around to these books some time before the next century. 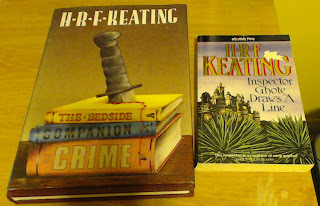 These two books are by the late H. R. F. Keating. Inspector Ghote Draws a Line seems like an interesting read, but I was particularly intrigued by The Bedside Companion to Crime, which is a slim volume but seems to give you a surprising amount of information on all sorts of criminal aspects. 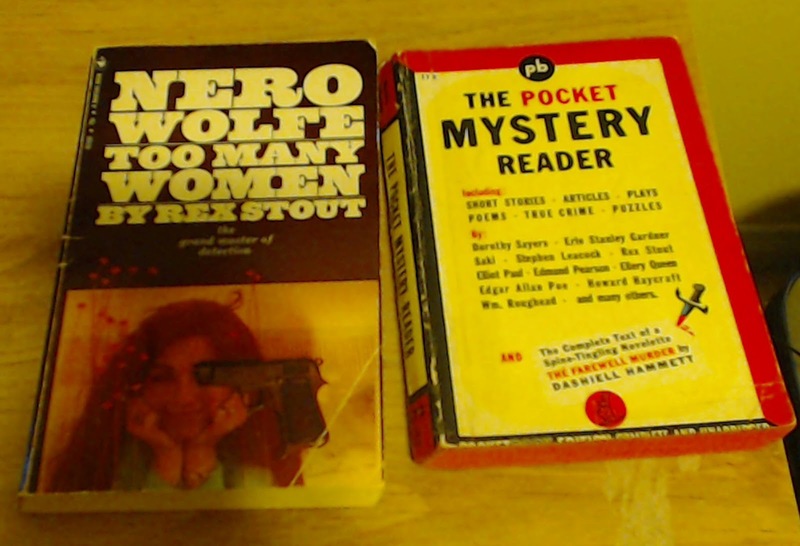 In case anyone is unaware, I love Nero Wolfe, and I skipped reading Too Many Women because I didn’t own a copy of the book. The mistake has been corrected and one of the few gaps in my collection is now plugged up. A companion to this book is The Pocket Mystery Reader, a Pocket Book that brings together all sorts of fun material, including Rex Stout’s famous essay Watson Was a Woman. 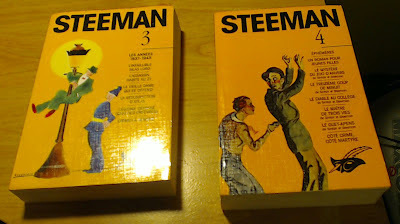 Contributors included Dorothy L. Sayers, Erle Stanley Gardner, Rex Stout, Ellery Queen, Elliot Paul (author of the interestingly-bizarre mess Mayhem in B Flat), and Howard Haycraft. 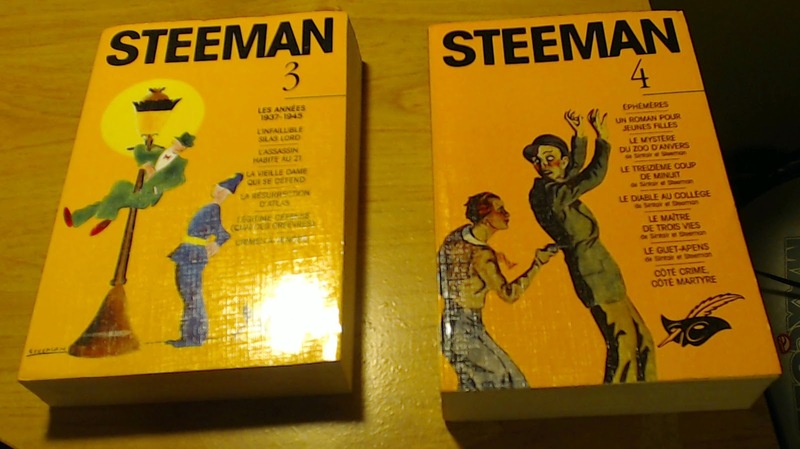 The next two books have little in common—they didn’t even come from the same bookstore. 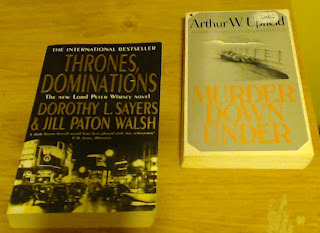 But I have intended to catch up with Arthur Upfield for a while now, and I’ve always been curious about Jill Paton Walsh’s continuations of the Lord Peter Wimsey series, being a big Sayers fan myself. How could I resist a reasonably-priced copy? At about this point in the photo session, I lost all originality and started grouping books any which way. But you can make the argument that this pair-up is of books by modern-day authors I admire tremendously. I love David Handler’s stuff, and so my purchase of The Girl Who Ran Off with Daddy needs no further justification. 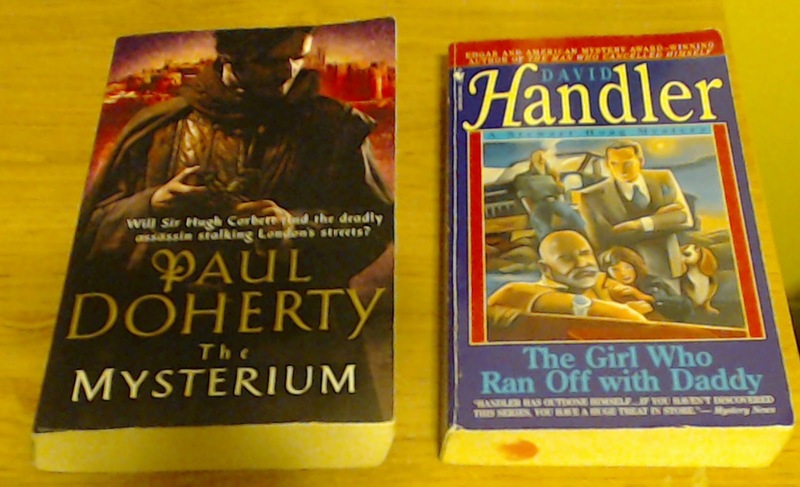 Paul Doherty is a terrific author of historical mysteries that often contain impossible crimes—so once again, do I need to justify my choice to purchase The Mysterium? 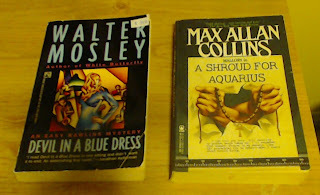 I was more or less forced to purchase Walter Mosley’s Devil in a Blue Dress for a class, but it looks like a good read, so I won’t complain too much unless I end up hating it. As for Max Allan Collins, I recently bought ten of his Nathan Heller books on my Kindle, when they were the Kindle Daily Deal. I figured I might as well go and buy one more book for the physical stack, and so I acquired A Shroud for Aquarius. 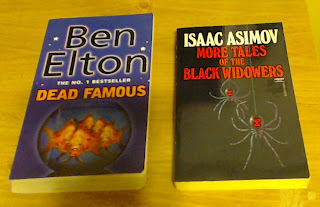 I have been meaning to read something by Ben Elton for a while now, and the brief plot-hint at the back of Dead Famous was too intriguing for words! How refreshing to see a plot summary that doesn’t give half the plot away!!! 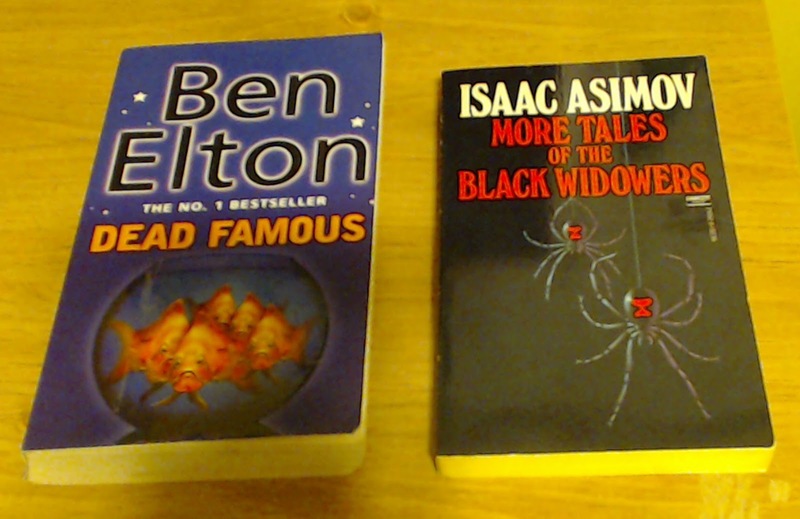 Meanwhile, Isaac Asimov is practically a guaranteed winner every time, so I refuse to give any justification for my purchase of More Tales of the Black Widowers. That’s right, it’s the complete A&E Nero Wolfe series! 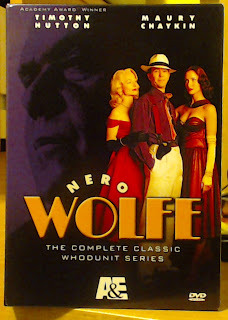 This brilliant series managed to perfectly cast the characters of Archie Goodwin, Nero Wolfe, and Inspector Cramer, and it takes much of Archie’s dialogue verbatim from Rex Stout’s original novels, allowing him to use this as voice-over narration. It works beautifully, and with such terrific sets and costumes and a terrific cast of characters, every episode I’ve seen thus far has been delightful. I cannot recommend this series highly enough, and with this purchase I will at last stop relying on my library’s copies of the films. Please excuse me for a moment while I sit here and continue gloating over my acquisitions. 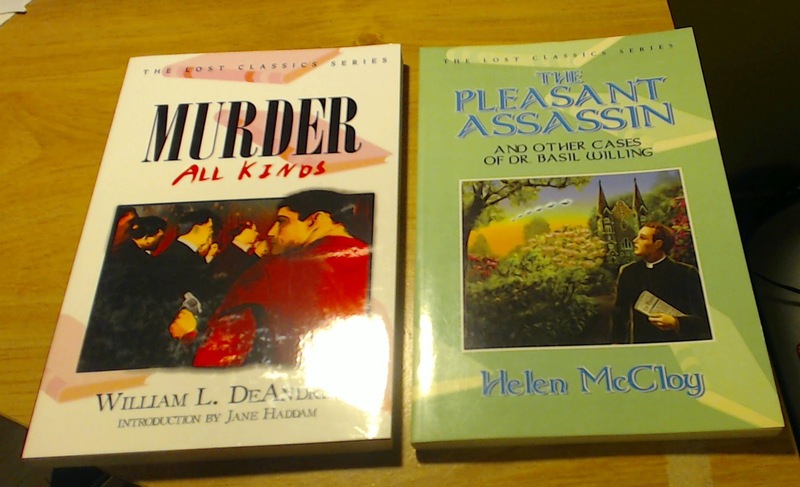 Are there any that you’d particularly like to see me review? Cool books (and awesome DVD set). 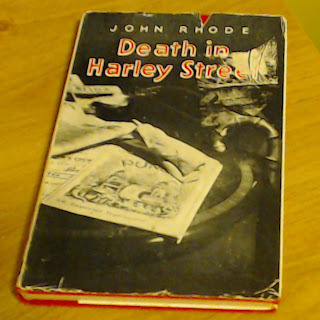 The ones I want to see you review the most are the Crippen & Landru collections and Death in Harley Street.